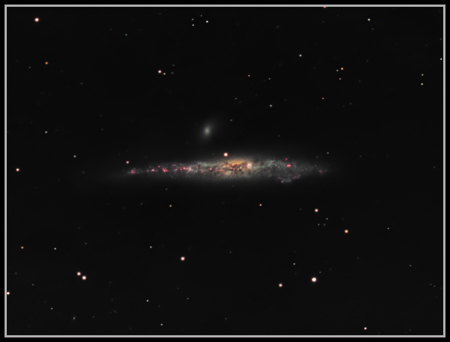 NGC 4631, The 'Whale' galaxy. This is an edge-on spiral, similar in size to the Milky Way, some 21 million light years away from us. The small companion elliptical galaxy is NGC 4627.
. it's thought that so many supernovae have exploded in this region that gas is being blown out of the plane of the galaxy. This can be seen in X-ray emissions. This image was taken with 2 cameras, a mono Atik 16HR for luminance and H-alpha, and an OSC 16HRC for the colour data. I borrowed the OSC camera as I didn't have much time available and wanted to grab the colour data quickly. 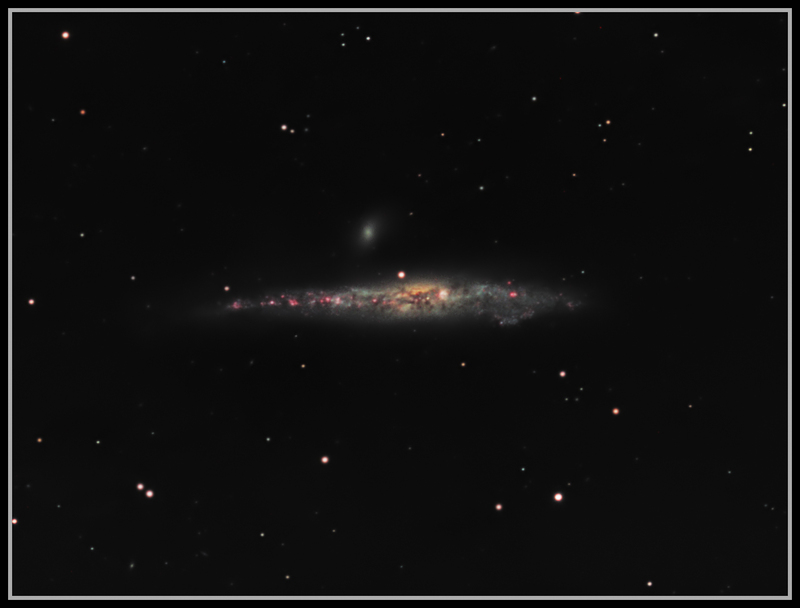 While this worked OK on the galaxy itself, the star colours are not correct, and I really noticed the difference here as compared to using coloured filters when it came to processing. personally, I prefer mono with filters. Ha was added to the red channel in 'LIGHTEN' mode at 50% opacity.